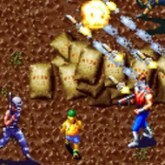 Description: Gundara is one crazy classic arcade army shooter with tons of fast action. Its a shame that this game has been under the radar for years, living in the shadow of other fantastic army trooper shooters like Metal Slug, Shock Troopers and Mercs . Select from two characters who are army vets, they are out to take out all bad guys and robotic enemies by themselves. These levels are cool and the short story is pretty neat, loved the ending :D.
Game Controls: Shift Key = Insert Coin. Enter Key = Start. Arrow Keys = Move. "Z, X, C" Keys = Action Buttons. Select the option icons at bottom of the game screen to edit controls, Play In Full Screen, Save/Load game progress, and change graphics settings.